Why Play Chess With Your Children? Sachin Tendulkar, one of the greatest batsmen in cricketing history recently said that he played a lot of chess with his brother, but without much good result, but he did enjoy the game. He added that his son too took to chess first and then moved on to cricket. What are the advantages of chess? Why should you play chess with your children, at least on weekends? The best habit you can help create for your child is one that encourages a bond between the two of you. If you play weekly game of chess with them, your kid will feel special. Become your child’s chess partner and enjoy the results. Always remember that chess is not for nerds! It is for cool parents and cool kids. Game for of All Ages. You can begin chess at any age and there is no retirement. Age is also not a factor when you are looking for an opponent –you can play with your parents, grandparents, uncles, aunts – the possibilities are endless. Chess helps children with physical disabilities to improve their motor skills as the movement of pieces are in the left, right, forward, backward and diagonal ways. Chess is Fun. Unlike many of today’s video games, chess leads to interesting conversations as well as unsuspecting humour. The game causes a person to interact with another human being in an activity with endless possibilities. Creative Game. No chess game ever repeats itself, which means you create more and more new ideas with each game. It is never boring and repetitive. You always have something to look forward to. Every game you are the general of an army and you alone decide the destiny of your soldiers. Cheap and Easy Entertainment. Considering the monthly bills of satellite TV, and video games, which reduces real communication between family members, chess is a real good option. 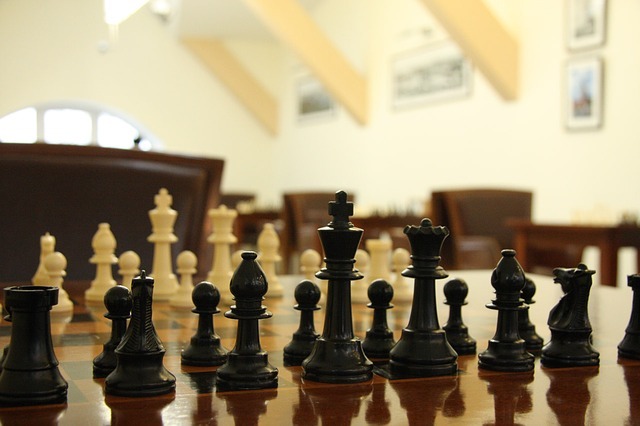 The game of chess has been around for centuries, and once you begin to play it, you are sure to be immersed in it. Playing chess with your child gives you an excuse to make time for your child. Develops Memory. The chess theory is complicated and many players memorise different opening variations. You will also learn to recognise various patterns and remember the variations. Chess is also a game of experience. If you want to win successive games, you will have to learn from your earlier mistakes. Chess surely enhances your memory power. Develops Logical Thinking. The game of chess forces players to multi-task, plan ahead, and make real-time executive decisions. Chess disciplines the mind, which is ideal for children, as they are constantly yearning for opportunities to be challenged. Chess requires some understanding of logical strategy. Mistakes are inevitable and chess is a never-ending learning process. Chess develops the capability to predict and foresee consequences of actions. Promotes Imagination, Concentration and Creativity. It encourages you to be inventive. There are an indefinite amount of beautiful combinations yet to be constructed. Chess has also proven its ability to calm aggressive children. The need to sit still in one place and concentrate on the board will bring a calming effect on children. Self-Motivating. It encourages the search of the best move, the best plan, and the most beautiful continuation out of the endless possibilities. It encourages the everlasting aim towards progress, always steering to ignite the flame of victory. You are forced to make important decisions influenced only by your own judgment. The more you practice, the better you will become. You should be ready to lose and learn from your mistakes. Chess and Psychology. Chess is one game that teaches a child patience and willpower. It improves a child’s ability to interact with his opponent albeit in a silent way. This enhances confidence as well as self esteem and makes one a good listener. Listening can go a long way in improving interpersonal skills. Chess tests your sportsmanship in a competitive environment. Chess and Your Child’s Grades. Chess develops the scientific and logical way of thinking. While playing, you generate numerous variations in your mind. You explore new ideas, try to predict their outcomes and interpret surprising revelations. You decide on a hypothesis, and then you make your move and test it. Each game is different and there are several numerical possibilities to a strategy. Having to deal with this will develop a scientific way of thinking which is very essential when faced with multiple solutions to a problem. Being able to quickly analyse the effects of each move is what will enhance a child’s mental mathematical as well as analytical abilities. When in Grade 8, being fascinated by the game, I requested my friend Aravinda Bose to teach me the game and he was all too willing to teach me and take me through my ‘Green Horn’ days. On returning home for vacations, we procured a chess set from our father and I taught my three other siblings to play chess. We played each other and learnt a lot from it. Later I taught our children to play the game and now they beat me hollow. From my experience of learning and teaching the game at a young age, one of the recommended methodology to teach chess to children would be as follows. Acquire pictures of the characters in medieval time warfare from the internet. Then introduce the child to the Pawn first and explain that persons’ role in the army. This is to help him develop a personal relationship with the piece which will give a better understanding, or feel, of that piece’s place and role. Place the chess-board on the table with the bottom right hand square as white. As you play, engage the child in constant conversation directed at the move just made, potential next move, and so on. Explain why this move might not be such a good one, and why this move would be a good one. Once you believe he is totally comfortable with the moves and responsibilities of the Pawn, introduce the King. After the pictures and description, add him to the board with the Pawns and continue to play. Continue in this theme introducing the other pieces to the child in this manner, taking whatever pace that child requires. Never rush them to the next thing as long as they are still struggling with what they have been doing. Watch closely for signs of boredom and be prepared to stop play and go do something else for a while. By following this methodology when you have finally arrived at a full board of players, your child will have a thorough knowledge of each one, know them like family and be prepared to move into the more complex moves. If you are fortunate enough to see your child stick with it and learn the game, you will have set the child’s foot on the path to a much easier adjustment in school, better learning abilities and a far greater chance of succeeding in whatever the child attempts. Reji, fully agree with you. Chess is a great game & it develop multi talents. No wonder it was the game of Royals. After mastering the game in the chess board now lot of the parents are (applicable only to N America) practicing it in various Samajams / Associations on a real world scenario. So they hardly find time to play with their children / spouse. Reji, fully agree with you on game of Chess. It does help to develop logical appreciation, think ahead & plan your moves, better man management & a horde of other benefits. I successfully dealt with Managers, Workers, Union leaders & antisocials while working in a large factory here for 7.5 years all due to Chess. I could always predict their move & take timely corrective action. Thank you Chess. Reji, I still remember Sailappan teaching me this in Feeder house. I was probably in the last 5 in the class till then. I started liking Maths classes…. Coincidence ! His last words to my son were ” Your uncle let you win ” My son did win a game with my Bro. A game so very enchanting. A great indoor game for two. But too slow for my liking!! I have played a lot of chess in my childhood, but having two siblings, preferred other games such as carrom or bridge. Nevertheless, a great game which is played even on local/short distance (panchvati express) trains in mumbai!! It was a great source of entertainment while you were standing in the train and watching people seted playing the game. These days no on plays it, mobile games and songs keeps everyone busy!! Perhaps it needs to be revived by your blog!! Reji, As always an excellent topic explained lucidly. I am too fond of Chess. Played with cross section of society incl my children. Even today I have a magnetic Chess board. Chess definitely teaches you to plan your moves in advance and also anticipate the moves of opponent. It helps in appreciation so one is better equipped mentally to handle any situation more logically. I used this trait while working in a large factory for 7 .5 yrs. So I could anticipate in advance the moves of all the Managers, Supervisors, Workers and Union Leaders working under me. I could take counter measures in time and scuttle their anti org activities. I was successful and we all were happy. Keep writing Reji and enlighten us on various subjects. Thanks. The benefits of chess have been very aptly put across. It is unfortunate that due to various distractions of modern day life, chess is being relegated to background.